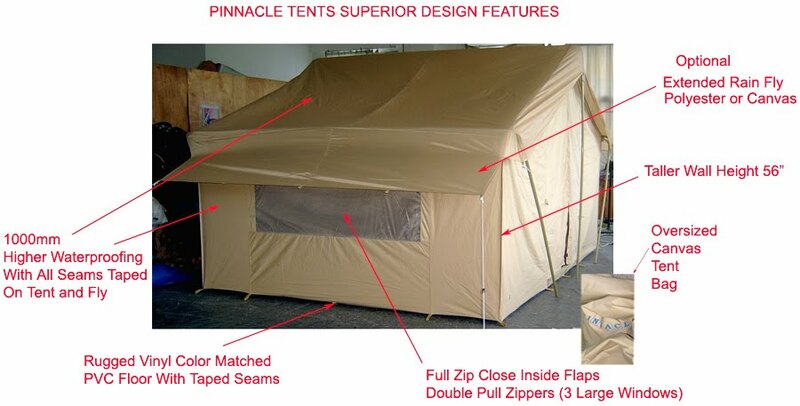 Yes, we sell individual tents and ship them from our warehouse in Phoenix, AZ. Do you offer the extended polyester rainfly for tent model 644? No. Currently we only offer the extended rainfly on our Pinnacle Canvas Tent #647. When we manufacture new #644 canvas tents we will design the rainfly with the extension. great tent, extremely dependable.It needs an E port zipper in one corner and a tent storage bag like the Kodiak tent, cinch bag, and a canvas tent pole bag. This would make it the perfect tent. Can I get a 647 with the original non-extended rainfly? Due to popular demand we manufacture all of our canvas tent 647 rainflies with the extensions over the windows. The extensions allow the windows to be open during for ventilation during rain storms. They can be configured to block more of the window or guyed out at an angle to allow for viewing or more light to enter the window. How often do you have to apply waterproofing on the 647 canvas tent? What product do you recommend? The waterproofing should last the life of the tent. Avoid contact with bug repellents or insecticides or any liquids that are petroleum based as these will degrade the waterproofing. Make sure that the tent is completely dry before putting it away and store in a dry place to prevent mold and mildew. If you ever need to apply a waterproofing treatment we recommend products from Nikwax since they are water based.